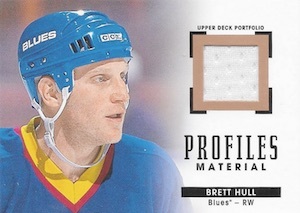 2015-16 Upper Deck Portfolio Hockey is a hobby-only, image-centered set with a large checklist and several subsets. Collectors will find one autograph and one memorabilia card in every hobby box. 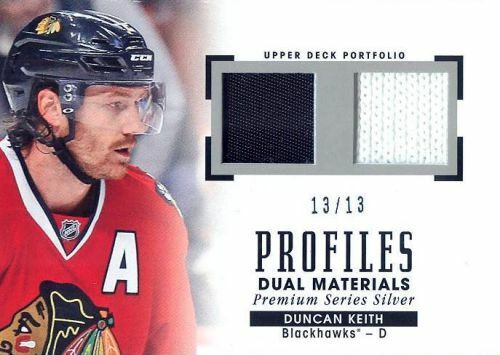 Featuring a deep base set, a total of 340 cards are broken down into multiple subsets in addition to the standard 200-card set in 2015-16 Upper Deck Portfolio Hockey. This includes Black & White Art (1:40 packs), Color Art (1:14 packs) and Wire Photos (1:7 packs). Celebrating the deep class of first-year players, Rookie Phenoms are heavily featured in each of these subsets with Black & White Art (1:40 packs), Color Art (1:14 packs), Color Photo (1:3 packs) and Wire Photos (1:7 packs). Many of these base cards for both the veterans and rookies also can be found as Autographs with varying rarity. 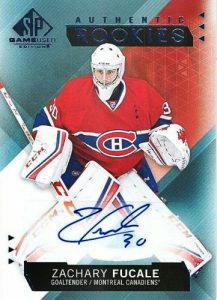 Beyond the the base autographs in 2015-16 Upper Deck Portfolio Hockey, there are several other inserts to chase. 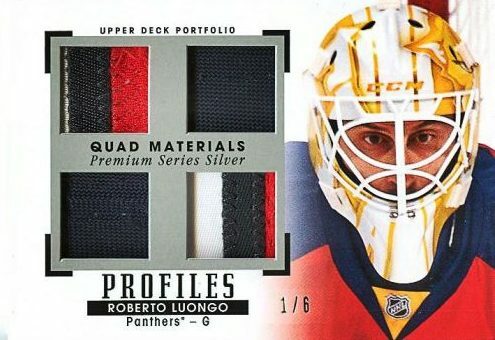 This includes memorabilia inserts Profile Materials (1:33 packs), Profiles Dual Materials (1:100 packs), Profiles Material Quad (1:250 packs) and Profiles Material Six (1:1,000 packs). Each version comes as Silver (#/33 or less) and Gold (#/13 or less) parallels. Highlighting six top prospects from the 2016-17 rookie class, 2015-16 Upper Deck Portfolio Hockey XRC Rookie Redemptions look to the future. Lastly, adding to the limited rookie options from 2015-16 SP Game Used, 36 SP Game Used Update rookie cards in 2015-16 Upper Deck Portfolio Hockey are numbered to their jersey number and also include Autographed versions (1:160 packs). Overall Odds: Wire Photos - 1:7 packs, Color Art - 1:13 packs, Black & White Art - 1:40 packs. Overall Odds RC: RC Color Photos - 1:2.5 packs, RC Wire Photos 1:7 packs, RC Color Art - 1:13 packs, RC Black & White Art - 1:40 packs. 6 cards. Overall Odds: 1:360 packs. PARALLEL CARDS: Wire Photo - 1:480 packs, Color Art - 1:720 packs, Black & White Art - 1:1,440 packs. AUTOGRAPH PARALLELS: Color Photo - 1:1,000 packs, Wire Photo - 1:1,333 packs, Color Art - 1:2,000 packs, Black & White Art - 1:4,000 packs. 198 cards. Specific group odds listed below. Overall Odds: Color Photos - 1:53 packs, Wire Photos - 1:375 packs, Color Art - 1:750 packs, Black & White Art - 1:1,500 packs. Overall Odds RC: RC Color Photos - 1:80 packs, RC Wire Photos - 1:300 packs, RC Color Art - 1:600 packs, RC Black & White - 1:1,200 packs. Overall Odds: 1:33 packs. Specific group odds listed below. Overall Odds: 1:100 packs. Specific group odds noted below. PARALLEL CARDS (No card #GL): Silver Premium Series #/13, Gold Premium Series #/5. Overall Odds: 1:250 packs. Specific group odds noted below. PARALLEL CARDS: Silver Premium Series #/6, Gold Premium Series #/2. Overall Odds: 1:1,000 packs. Specific group odds noted below. 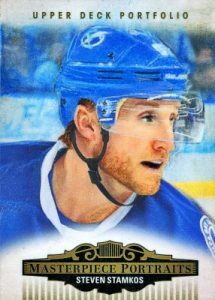 PARALLEL CARDS: Silver Premium Series #/3 (No card #TH), Gold Premium Series 1/1. Overall Odds: 1:160 packs. Specific group odds noted below. Wow. Sticker autos on wire photo cards? Really. This is a flush worthy release. wow !! this product looks like a decent product !! with a decent price point !! This isn’t even artwork! Looks to me like a computer program made to look like art. With each product, UD gets a little worse. No way they keep the exclusive when it is up. How can they? Also, This will be one of you least opened of the hockey products. There is no place for this. Why not just do masterpieces with real art? Mike Gogal. You can be a UD sympathizer all you want. You can not say this is a good product or concept. Name the interesting cards? it isn’t even real art! it is a sticker and jersey dump, plain and simple. You are correct. I should probably look to a new hobby because UD is intent on ruining this one. Do you work for UD? what im saying is. for 100/box your getting a decent bang for your buck !! that’s all.the rookie content is very good,plus the spgu rookes and the rookie redemptions are not a bad touch. Having watched a ton of breaks – while not spending a cent on this personally…. 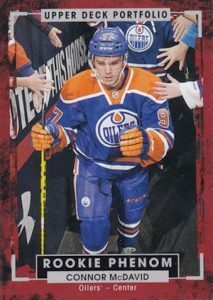 This is exactly what upper deck needs to mass market – but it should Only be sold at Walmart and should only cost $34.99 CAD a box. Not $99+. It would be perfect for kids/family just starting off in collecting cards. Buy a box – get a ton of inserts and interesting (marginally) types of cards – and maybe strike an auto or jersey of someone you may have heard of….maybe. In terms of this product being collectible/ hobby type stuff – not a chance. Zero value. Zero. Most boring looking jersey cards ever. Ever. SP game used updates – yeah, nobody cares…..
None of these cards (apart from some of the crazy /3 or /1 cards) will ever retain any value beyond say about this coming Sunday…..when the 1st round of ebay auctions end. Save your money. But again, if it cost 1/3 (even 1/2) the current cost, it could eclipse series 1 in terms of mass appeal. I would agree with you mate if it was not a budget collection. This is a low-mid-end product and after opening 2 cases I can say you get what you payed for. If it were Black, yes, you should expect 4 colours patches and low numbered cards, but this is not the case here. I belive the idea with a big checklist with different types of images (real ones, drawings, wire photos, etc.) is great. The other sets are exactly like every set in every low or mid end product: autos on stickers and monocolor jerseys. I don’t see why one would be so mad against this product. 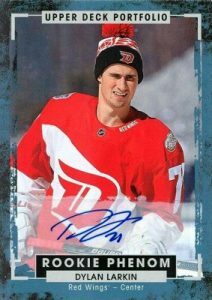 This is a normal Upper Deck product and people who don’t want to invest a lot in hockey cards will find it pretty nice. Sure, if one wants THE big hit, he shouldn’t buy Portflio. He can wait for Ultimate or the Cup. It’s between 3.5 and 4.0. For about twice the cost of a box of MVP, you get two hits. Are they going to be great hits? Probably not. But it’s still 2 more hits guaranteed than in either MVP or O Pee Chee. (I understand the latter is for set collectors. Not hit finders.) And this is from someone who has been so disappointed in UD this season that except for S1/S1 and OPC I stopped buying. 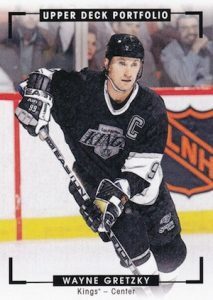 Too bad Upper Deck could not just mail you the sticker with an autograph and a coa. Then we could buy a hockey stick, photo or hockey puck and place the sticker on it, then bang it is autographed. I question these odds. 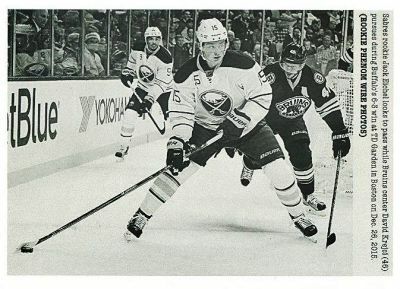 Like the Parayko art rookie is 1/4000 packs. I got two in two boxes. The Parayko Rookie Color Art Autograph is listed as being part of Group A at 1:4,663 odds. These odds are the combined odds to pull any one subject from Group A of this subset. 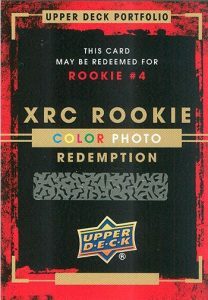 The overall odds for the Rookie Color Art cards is 1:600 packs. So, if you pulled two Parayko Color Art autographs in two boxes, you were very lucky based on these odds. Does anyone know who these players are? 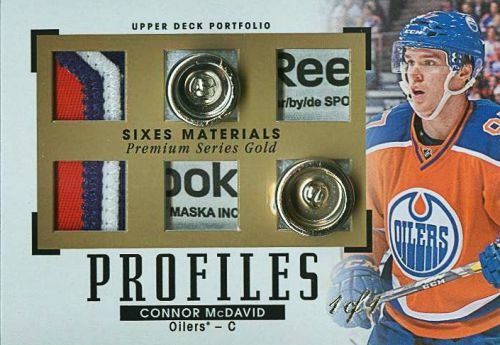 Looking back at this set it clearly wasn’t the best of that year nor was it the nicest in design but its one of the only low end sets that Upper Deck produced that year that contained the actual rookie cards of McDavid, Eichel, Etc. 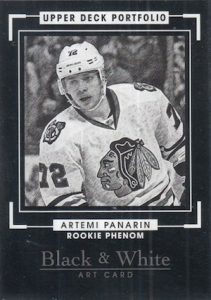 Thankfully Upper Deck would produce more low end sets the year after and actually put the superstar rookie cards for that season in just about every set they produced. Bought an 8-box case of 2015-16 Portfolio, was an absolute blast! Hit autographs of Pekka Rinne, Al MacInnis, Viktor Arvidsson, etc. Also hit the Jamie Benn Masterpiece Portrait 1/1 card. Will definitely buy another case of this product.